AfterDeployment offers self-assessments, interactive exercises, and video-based educational tools to help with a wide range of behavioral health topics. PTSD Foundation of America offers a PTSD self assessment test. The National Center for TeleHealth and Technology has developed numerous helpful mobile apps for the military community and care providers. The organizations listed below support the warrior and family. Wives, significant others, moms, sisters, please visit this LINK to get connected and receive support and encouragement online and locally. Branches of Valor offers resiliency groups, peer mentors, retreats, conferences and events. Find other warriors and families experiencing life after war. ​Courage Beyond (formerly Not Alone) is a national non-profit organization that provides confidential, no-cost programs and services to warriors and their families facing post traumatic stress disorder (PTSD) and combat stress. In 2008 a group of warriors and professionals discovered a significant gap in the government's capacity to help warriors and their families come home from war. There needed to be a confidential online community where those warriors could congregate to help each other. Our personal experiences with war trauma led us to reach out to those that need help. Courage Beyond draws on a unique group of individuals with personal experience in the Iraq and Afghanistan war. We have been in your shoes. We have struggled to regain our lives and to find the new normal at home. Professionals, warriors and experts have been vital in helping to bring the Not Alone vision into reality. We've been through the experience of war and returning home from war and hope that our persistence, experience and passion can help others in their journey as well. We understand. We get it. The Ghost Rider Foundation (GRF) is a nonprofit organization whose purpose is to assist veterans of the U.S. Armed Forces who have PTSD, specifically in the NE Ohio area. Named to honor the memory of an Iraqi war from Mount Sinai, NY, the Joseph P. Dwyer Veteran Peer Support Project is a peer-to-peer program for Veterans facing the challenges of Post-Traumatic Stress Disorder (PTSD) and Traumatic Brain Injury (TBI). Launched in 2012 as a pilot partnership between our Suffolk County United Veterans program and the Suffolk County Veterans Service Agency, the Dwyer Project takes a confidential, one-on-one, peer-to-peer approach that has rapidly captured the attention and support of both veterans and mental health professionals statewide and across the nation. The program has steadily demonstrated that the peer-to-peer model holds tremendous, untapped value as a tool for helping Veterans transition and reintegrate back into civilian life. LifeTroops,Inc. is a non-profit based out of Oklahoma City, Oklahoma. We work together with military members as well as veterans who struggle with Post Traumatic Stress Disorder(P.T.S.D), as well as other combat related illnesses, to bring relief and restoration to them and the loved ones close to them. Our mission offers a faith-based outreach program which encompasses the Spirit of the triad to help soldiers during the healing process. Our vision offers an enduring support system of military members through spiritual mentorship, counseling, educational and other programs that will “bridge the gap” between reintegration and everyday life. Hope, help and support for spouses, families and all loved ones of veterans, and those who serve, especially if they struggle with PTSD. Our mission is to operate on a standing commitment to reach the brokenhearted, with a specific calling to assist our nation’s military Warriors and families find a new life purpose through a hope in Christ, after enduring hardship through their service to America. Mighty Oaks provides two options for local veterans, service members, spouses and Mighty Oaks Warrior Alumni to find support, healing, and camaraderie. They can be found through Official Mighty Oaks Outposts and through Affiliate Outposts. These meetings aim to support each other as the members continue to grow and face challenges pre or post programs and is essentially our aftercare and accountability program. Outposts are run by Mighty Oaks Program Leaders and carefully vetted organizations and are in strategic partnerships with affiliate churches and organizations for support and quality supervision. It is at these weekly meetings where our commitment to “No Man Fights Alone” becomes reality, and the purposeful life is practiced. No Vet Alone is a national peer support network to empower resilience for America’s Finest. Our network helps create communities that provide resources and tools to help our nation’s heroes improve their lives. Veterans are encouraged to GET CONNECTED and GET INVOLVED. Our focus is on how to improve resilience through group activity, community service, and family support. Our nation-wide network of community programs provides a vital lifeline for those who serve our country. No Vet Alone changes the lives of veterans, first responders and their families by improving the issues they face: PTSD, mental health, physical wellness, homelessness, drug addiction, depression, and isolation related issues that directly affect their wellbeing. No Vet Alone inspires hope and community that fosters the will to live. Point Man Ministries is run by veterans from all conflicts, nationalities and backgrounds. Although, the primary focus of Point Man has always been to offer spiritual healing from PTSD, Point Man today is involved in group meetings, publishing, hospital visits, conferences, supplying speakers for churches and veteran groups, welcome home projects and community support. Just about any where there are vets there is a Point Man presence. All services offered by Point Man are free of charge. Homefront groups are lead by Christian mothers, wives and friends of both active duty military and veterans. They provide an understanding ear and caring heart that only those left behind at home can understand. They have experienced the stress of dealing with deployments and the effects of a loved one returning home from war. If you have someone you love deployed or having issues readjusting since coming home get connected with a local group or contact HQ for assistance. Combat veterans helping combat veterans. The mission of Project Josiah Restoration Ministry is to bring combat veterans together to strengthen, to share and to improve their lives; to empower them to make choices using biblical principles; to heal themselves and to enable them to help other veterans. War wounds the soul. But through REBOOT Combat Recovery, combat veterans and their families are experiencing breakthrough in their war against PTSD. REBOOT’s faith-based combat trauma healing course is designed to address the spiritual wounds of war. At REBOOT locations across the country, combat veterans are healing, divorce rates are dropping, medication abuse is decreasing and suicide numbers are being reduced. Learn about posttraumatic stress disorder (PTSD) from veterans who live with it every day. Hear their stories. Find out how treatment turned their lives around. Our mission is to help you and your loved ones manage the challenges that are often faced following a deployment. Here you will find information and self-guided solutions for dealing with post-traumatic stress and war memories; conflict at work; depression; anger; sleep problems; alcohol and drug abuse; stress; relationship problems; kids and deployment; spiritual guidance and fitness; living with physical injuries; and health and wellness. This site is dedicated to you... whether you're a veteran or someone who loves a veteran. It was created trying to figure out how to handle the "after shocks" of combat including PTSD and TBI . We're here to help you find your way, find the information you need, and find a way not only to cope with life after combat... but to survive and thrive! Veterans' families in downstate New York and New Jersey are able to access this for free. It may be made available to other veterans' families in 2012. Family of Heroes is a role-playing resiliency training simulation where family members learn essential skills to manage common challenges facing families in adjusting to post-deployment life. This includes managing expectations from their veteran’s return, learning to identify post-deployment stress, and managing conversations with the goals of de-escalating arguments, negotiating family responsibilities, and, if needed, motivating the veteran to seek help for post-deployment stress, PTSD, TBI, or suicidal ideation. Kognito is an award-winning developer of online role-playing simulations and games where users build interpersonal skills to effectively manage challenging conversations in the areas of health and behavioral health. These simulations provide organizations with cost-effective solutions for training large or geographically dispersed audiences with engaging and effective learning tools that include deliberate practice and personalized feedback. Love Our Vets - PTSD & What About Me? PTSD & What About Me? 7 Tips for Loved Ones of Those with PTSD is the stirring talk Welby O’Brien gave at a recent VA Caregiver Conference, which was so well-received that she was asked to make it available (and free) to EVERYONE who cares for someone battling PTSD. Professionally filmed in an intimate setting, PTSD & What About Me? is designed to be viewed either by individuals or groups. The first 90 seconds will give you a good feel for this heart-to-heart 35 minute presentation. Accompanying handout can be downloaded. Brimming with information, insights and inspiration! Be prepared to laugh, cry and come away encouraged. Make the Connection​ is an online resource designed to connect veterans, their family members and friends, and other supporters with information, resources, and solutions to issues affecting their lives. This site can help you find a VA PTSD program near you. The Support And Family Education (SAFE) Program is an 18-session family education curriculum to support families in dealing with a loved one's PTSD or mental illness. Each session contains didactic information, handouts, discussion questions, and activities. The entire curriculum is available for free download on our website. America's Heroes at Work is a U.S. Department of Labor (DOL) project that addresses the employment challenges of returning service members living with Traumatic Brain Injury (TBI) and/or Post-Traumatic Stress Disorder (PTSD) - an important focus of the President's veterans agenda. The project equips employers and the workforce development system with the tools they need to help returning service members affected by TBI and/or PTSD succeed in the workplace - particularly service members returning from Iraq and Afghanistan. PTSD Residential Rehabilitation Treatment Program - The PTSD RRTP is a 26-bed program designed to assist Veterans in learning to live successfully with Post Traumatic Stress Disorder (PTSD) developed as a result of military experiences. Private and safe accommodations are available for women veterans. Military-related PTSD affects many areas of a veteran’s life and each area is addressed within the context of the program. Recovery-oriented goals are identified by each Veteran and problematic areas such as guilt, intrusions, avoidance, anger, and substance abuse are addressed within the context of achieving those goals. The program offers an intensive treatment approach in which Veterans attend therapeutic activities on a daily basis. Treatment modules aim to improve areas of daily life through group therapy and skill-training modules. An initial course of treatment emphasizes evaluation, education, and many coping skills. Veterans then transition directly into the trauma processing phase of treatment. Evidence Based Treatments such as Cognitive Processing Therapy (CPT), Prolonged Exposure (PE), and Cognitive Behavioral Therapy for Insomnia (CPT-I) are utilized. Camp Hope will provide interim housing for our Wounded Warriors, veterans and their families in a caring and positive environment. Our goal is to open Camp Hope in 2012 with the initial capacity of 20 residential and family units. Camp Hope is located in a quiet and safe setting whereby veterans and their immediate family members can find healing, help and hope while benefiting from intensive treatment for Post Traumatic Stress under the care of licensed professionals, pastors and their peer mentors. The Camp Hope staff understands that those who have served this nation are still struggling with the invisible wounds of combat and we are working to assist our troops in putting the pieces of their lives back together. The Camp Hope staff will use the necessary traditional counseling tools and incorporate a faith based approach to help combat the effects of Post Traumatic Stress. Simultaneously staff will be assisting troops with a myriad of issues to include job placement, transportation and peer support groups integration. The Camp Hope community will embrace our troops, veterans and their families as they seek the rewarding and fulfilling lives they so richly deserve. The Home Base ICP is staffed by Massachusetts General Hospital clinicians and fitness and nutrition experts, all of whom who are trained in military culture and specialize in treating the Invisible Wounds of War. In addition, Post-9/11 Veterans & Blue Star Family members serve as patient navigators for veterans and families enrolled in the program. Transportation, lodging and meals are covered for a participating veteran and an accompanying family member. For those who have insurance, the treatment costs will be billed; however the veterans will never have co-pays or further out of pocket costs. For those without insurance, full treatment is still available. Veterans and families will never be denied based on their ability to pay. The Pathway Home, Inc. provides comprehensive treatment for our nation's military personnel who have served in Iraq and Afghanistan. We assist those impacted by Post Traumatic Stress (PTS), Traumatic Brain Injury (TBI), and other post-combat mental health challenges to successfully reintegrate into their families and the community at large. Wounded Warrior Homes is a charitable non-profit organization providing transitional housing to single post 9/11 combat veterans with Traumatic Brain Injury (TBI) and Post-Traumatic Stress (PTS). For the men and women who serve our country with Traumatic Brain Injury and Post Traumatic Stress, a home is the simplest, yet most essential item in their lives. It is a comfort and a hideaway at the end of a long day, and a place to call their own that gives them independence. Wounded Warrior Homes looks to provide homes for veterans who served to protect ours. Veteran's transitional housing is essential to service members returning from active duty. Many service members do not have the option to move home to continue their outpatient medical care and access the services they need. Families may live several hours from the closest VA Hospital or they may not live by one at all. By providing affordable transitional housing and hands-on resources, Wounded Warrior Homes provides a defined path for each member to transition from active-duty military service to a veteran of foreign wars. The activities of Hearts Toward Home International are carried out with special emphasis on addressing issues that prevent present military personnel, as well as all war veterans, from re-entering society and having a quality life. The organizational purpose is to come to the aid of those war-fighters who have been exposed to traumatic experiences and who suffer from post-traumatic stress disorder (PTSD) after serving in military hazard zones. Additionally, HTH International is equipped to train facilitators and counselors in the skills of re-integrating military personnel with loved ones, and the civilian environs to which they return. Operation Healing Journey is a proactive approach in assisting to fill the transitional and medical gaps from the departure of the military into the civilian sector. Operation Healing Journey is focused on utilizing the resources from within the community and works in conjunction with regular medical practices to provide a structured three month program that will empower the veteran to find and seek healthy alternatives along the transitional and healing journey. Homes for Healing assists veterans who suffer from Traumatic Brain Injury (TBI) and Post Traumatic Stress Disorder (PTSD). It is estimated that 360,000 veterans who served in Iraq and Afghanistan since 2003 suffer from TBI, which causes neurological damage and can impact one’s behavior, emotions, memory, body functions, speech, and an array of other disorders. For someone suffering from TBI or PTSD, what once was a simple task can seem an insurmountable obstacle. MMIA assists veterans who suffer from these conditions, which in turn helps them in their healing process. The National Center for PTSD (NCPTSD) aims to advance the clinical care and social welfare of U.S. Veterans through research, education and training on PTSD and stress-related disorders. The PTSD Information Center has Fact Sheets and Videos to answer your questions on trauma, PTSD and related issues. Today more than ever there is a need for support. PTSD is a real problem that needs strong answers. If we can come together to face this disorder head-on we can address the issues that need our care and attention the most. Let's work together to manage this illness and give our troops the respect and support they need and deserve. The Real Warriors Campaign combats the stigma associated with seeking psychological health care and treatment and encourages service members to increase their awareness and use of these resources. To reach the broadest audience possible, the campaign features a variety of strategies including outreach and partnerships, print materials, media outreach, an interactive Web site and social media. The campaign features stories of real service members who have sought treatment and are continuing to maintain successful military or civilian careers. In addition, DCoE established the DCoE Outreach Center, a 24/7 call center staffed by health resource consultants to provide confidential answers, tools, tips and resources about psychological health and traumatic brain injury. The Outreach Center can be reached toll-free at 866-966-1020866-966-1020 or via e-mail at resources@dcoeoutreach.org. Real Warriors, Real Advice is a weekly podcast series in which warriors, veterans and military families highlight the importance of seeking care for invisible wounds and offer tools and tips on building and maintaining psychological resilience. Access and download selected episodes HERE or subscribe to receive weekly updates automatically. Getting help shouldn’t be difficult. At Headstrong, we offer completely free and confidential treatment for post 9/11 combat veterans in NYC and Southern California (San Diego and Riverside Counties). Our program was created by leading experts of trauma therapy at Weill Cornell Medical Center and you will work with world class clinicians of trauma therapy to develop treatment that is designed specifically for you. Dealing with a mental health problem is hard enough. Getting help for these issues should not be hard. VA provides numerous ways for veterans to get the help they may need to keep mentally healthy. You can also find a program that will help you and your loved ones. Veteran’s Heart Georgia fosters the healing of veterans of all wars by attending to the spiritual and emotional needs of veterans, their families and our communities. We honor and support our service members, veterans and their families by addressing the effects of war through community-based services, resources and education. Welcome Back Veterans (WBV) was created to inspire Americans to give back to our returning veterans and their families. These heroes were there when we needed them--they served us all and kept us safe--and it's our turn to be there for them. WBV is committed to transforming the lives of our returning veterans by changing the way people think and talk about Post Traumatic Stress Disorder (PTSD) while providing ongoing treatment for veterans and their families in addition to funding research. The Combat Stress Recovery Program (CSRP) addresses the mental health and cognitive needs of warriors returning from war. CSRP provides military rehabilitation services at key stages during a warrior's readjustment process. While post-traumatic stress disorder (PTSD) and combat/operational stress are common after war-time experiences, Wounded Warrior Project® (WWP) approaches these issues from the warrior's perspective. We understand the stigma attached to mental health, post combat stress, access to care, and interpersonal relationship challenges. We challenge warriors to think about goal-setting and understanding their "new normal." Many warriors begin their journey with Project Odyssey®, an outdoor, rehabilitative retreat that promotes peer connection, challenging outdoor experiences, and healing with other combat veterans. The Tablets for Heroes program provides tablet computers to veterans of Iraq and Afghanistan who have sustained Traumatic Brain Injuries (TBI) and/or Post-Traumatic Stress Disorder (PTSD) while serving since September 11, 2001. Symptoms associated with PTSD and TBI can include disorganization, forgetfulness, and disorientation. With the aid of a portable computer tablet, they would have constant access to an electronic schedule, cognitive assistance, and consistent access to various forms of wireless communications to stay in touch with family, caregivers, or doctors. There are 7 applications downloaded on the tablets that serve as therapeutic programs, as well as copying and adaptability coaching applications. Tablets for Heroes will help our troops heal cognitively and allow them to be more self-sufficient, rather than relying on caretakers. Military OneSource (MOS) supplements existing family programs by providing a website and a worldwide, 24 hour, seven-day-a-week information and referral telephone service to ALL active, Guard and Reserve Soldiers, deployed civilians and their families. MOS services are provided at no-cost.This site is designed to help military families deal with life's issues. Call 1-800-342-9647 for confidential, compassionate support. 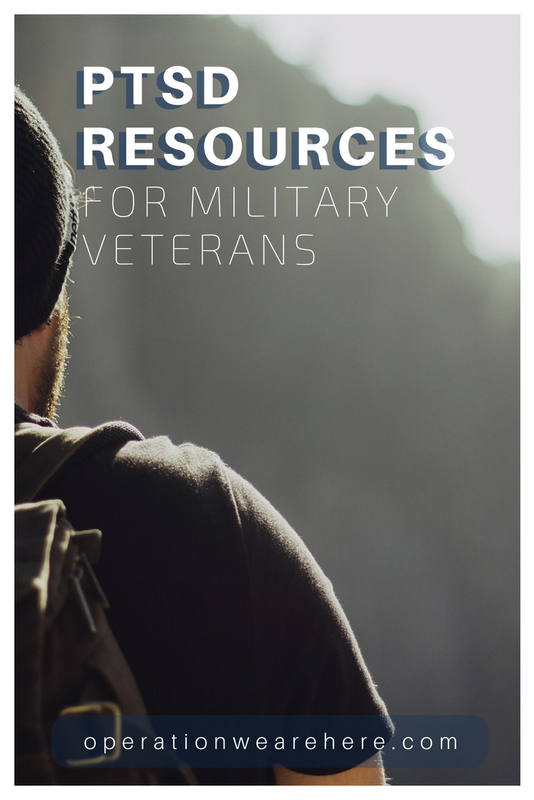 This resource that has helped several individuals with PTSD and anxiety, as well as allow them to sleep at night. They make customized weighted blankets at an affordable price. These blankets are filled with poly pellets for weight which puts extra pressure on the body, producing a calming effect. The deep pressure causes the body to produce endorphins and serotonin, the natural chemicals that result in relaxation and a sense of calm. Click on the titles below to be directed to that particular page of resources. Scroll down for additional resources.